This year’s Canadian Writers in Person Lecture Series featured author David Chariandy, who visited York University on March 19 to talk about his award-winning book, Brother. York University Teaching Assistant Dana Patrascu-Kingsley sent the following report to YFile. The Canadian Writers in Person series at York ended this year with David Chariandy’s visit. He spoke about his novel Brother, winner of the prestigious Rogers Writer’s Trust Fiction Prize. 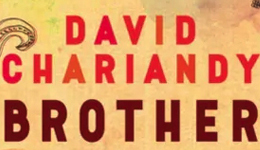 Set in 1990s Scarborough, Brother is a novel about two brothers, sons of Trinidadian immigrants, growing up with a single mother, who has to work several jobs to make ends meet. Their coming of age is set against the prejudices that confront them as young men of black and brown ancestry. Chariandy said that this book took him 10 years to write because “this is a novel I wanted to get right.” It is about a lot of issues impossible to ignore: state violence, police violence, communities that are ignored, love and tension between parents and children. Chariandy spoke about the contradiction of being a fiction writer and writing about fates he has glimpsed. This novel is not simply presenting his life story, but asking the question “what if”: what if his family situation had been a bit different, what if he had given in to anger, what if one of the police encounters had proven fatal. By asking these questions, Chariandy is making us contemplate how common variations on this story are, and how seemingly easy it is for the life of a young black man to be lost to tragedy. Violence is a fact of life for many people, but Chariandy did not want to make a spectacle of violence in this novel. “I wasn’t looking to write a hood novel,” he said. There is no depiction of Francis getting shot. The whole point is everything else: the friendships, the music bringing people together, the community.